This Qi charging stand is designed to work with your Qi enabled device. 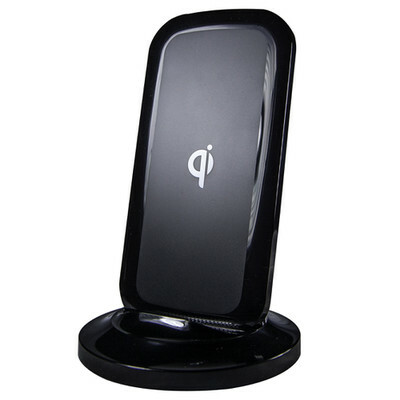 Wireless Qi charging capabilities are already built into certain phones such as the Google Nexus 4, Nexus 5 and the Nokia Lumia 920. If you have a Samsung Galaxy S3, Galaxy S4, Galaxy S5 or Note 2, we offer a wireless charging energy card that goes inside your current back plate and adds Qi technology to your phone. The iPhone 4 and iPhone 4S require a protective case that adds Qi charging technology. This pad will allow you to drop your Qi enabled device on top and wirelessly charge, no cables required! As a phone stand, it works great. As a charger, it overheats my phone and barely charges the battery. Slick idea and works very well. Super convenient. Charges my phone in about the same time as if it was plugged in. The only downside I can find is that there are a fairly limited amount of phones that have adopted the wireless option. I wanted to give these to friends as gifts, but most of them have iPhones and they are not setup very well for this technology. iPhones must use a "sleeve" which defeats the whole idea of wireless. I guess they will catch up to this technology in the next model?